For a number of our clients it is time to upgrade. 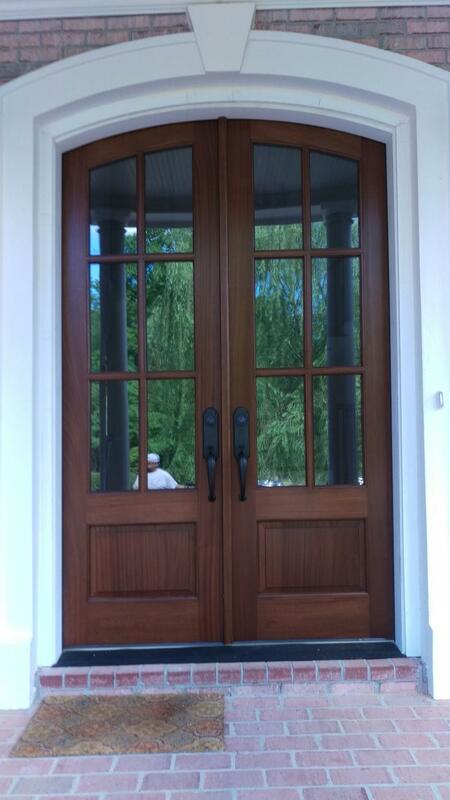 This often takes the form of changing their standard single 80 inch door, sidelites and transom to double doors at 92 or 96 inches. This means a whole new door system has to be engineered and installed. We will work with our clients to obtain a suitable doorway with Jamb unit of correct shape and size using our network of manufacturers. Once the new doors are chosen, they must be Finished in a stain and varnish of their choosing. This may include jamb unit, if stained. 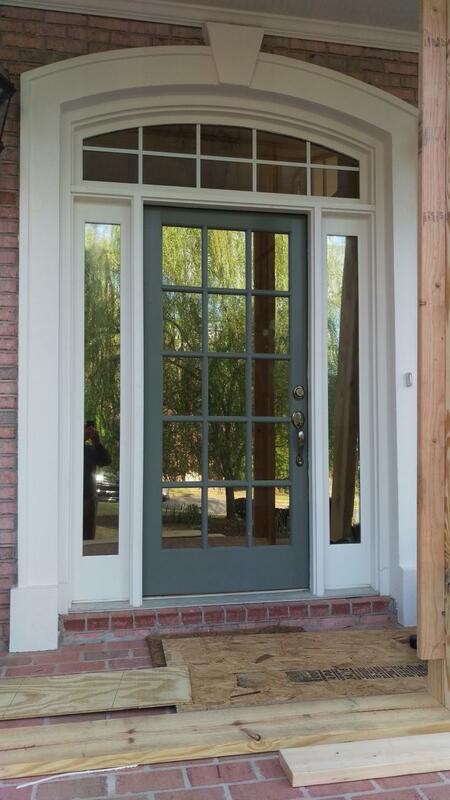 An alternate would be to have a paint grade door which would be pre-painted before installation. On installation day, we would bring all components ready to install. The process starts with demolition, i.e. 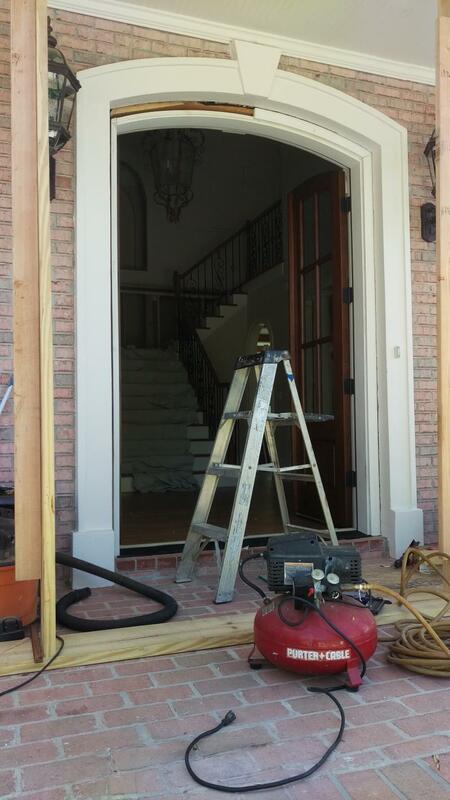 removal of the old doors and door accessories (trim, sidelites, transom, jamb, threshhold etc.) which would be desined for landfill. Once the old unit is removed we clean the area redy for the new units. The Jamb is first set in place and leveled and squared before attachment to the home structure. This has to be done with a high degree of precision or the doors won't operate properly. Once properly positioned and fixed the interior and exterior mold trim must be attached. These would then be sealed and'or painted. Silicone sealant is applied to all lower gaps around jamb and threshhold to provide long term waterproofing. Finally the new locksets must be installed after boring the holes in the door correctly to receive them. Finally a good clean-up of the work area. The whole process usually takes a full day to complete. Original entryway before removal. 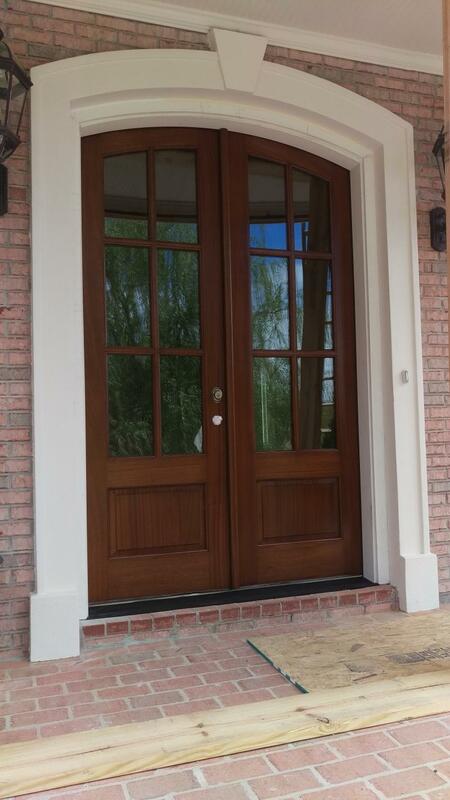 Standard 80 inch door with 2 sidelites and an arched transom. Other construction projects are ongoing while the work is undertaken, on this particular site, making the process more complicated than usual for us. Old entryway has been removed. New Jamb unit is installed after leveling and squaring. Finished doors have been hung and adjusted, as needed, to open and close correctly. Exterior Molding is being attached. Molding attachment is complete as is caulking around the trim. Door base is sealed. Only thing left to do is installation of the lockset which was done at a second visit due to delivery complications. A few days later, we returned to install the lockset. Other construction was now complete around the doorway which looks and works nicely.